WinScheduler allows users to create macros running in all Windows applications and use macro scheduler to run them at defined time or when a specific event occurs. Macro recorder (both keyboard recorder and mouse recorder) and macro editor is included. 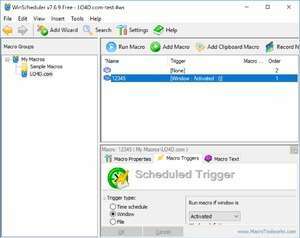 WinScheduler macros can consist from keys (keystrokes), mouse clicks and macro commands (file management, FTP, ZIP, encryption, clipboard, etc.). Version 7.6.9 is a freeware program which does not have restrictions and it's free so it doesn't cost anything. For security reasons, you should also check out the WinScheduler Free download at LO4D.com which includes virus and malware tests. Additional screenshots of this application download may be available, too.